Through our exciting affiliation with Exhibition Lists, we are able to offer our clients fresh lists of EXHIBITORS at hundreds of trade shows across the United States and abroad. These are lists with complete contact information so you can make direct contact. These are the EXHIBITORS. Our lists are excellent for prospecting for sales, etc. You receive CSV format of company name, address, phone, fax, email and website. We have thousands of shows available. If you are interested in specific industries or shows, please email us for availability. Most of our lists run between $50 to $100, depending on the counts. All of the lists are emailed to you, so be sure we have your correct email address when you purchase them. Lists are in Microsoft Excel and CSV format and emailed to you within 24-hours after purchase. We always send the MOST CURRENT exhibitor list. You will get the newest list closest to the show date. We compile 2-months ahead, so if show is past 2 months ahead we will send the list from the most recent past show. You receive CSV format of company name, address, phone, fax, email and website. We DO NOT include personal names or personal emails. Our IT staff compiles as much information as possible for each listing with an emphasis on emails, however we cannot promise all fields will be available on all lists, but strive for as much as possible. Clients can email us for current counts of any list prior to purchasing. Orders are filled within 24-48 hours after purchase, via email. WANT A LISTING OF ALL AVAILABLE SHOWS..... Click Here! SAMPLE csv file (random list): Click Here. THIS IS ONLY A PARTIAL LIST of the 1000's of trade shows that we have available. Please download our complete listing or email us with shows you are looking for and we will respond promptly with counts and quote. Our best deal is our MONTHLY LIST of all shows compiled. For $750 you receive ALL trade shows for that particular month. We compile two months in advance. Email with month you'd like and we will send listing of all the shows you will receive. Compilation of Exhibitors at 5 Imprinted Sportswear Shows in TX, FL, TN, NJ & CA. All 5 shows included in separate files. Exhibitor list from In Store Marketing Expo. List of exhibiting companies participating in the International Housewares Show in Chicago. Over 1290 exhibitors are listed. List of Exhibitors at the Las Vegas International Lingerie Show. List of exhibitors at Int'l. Book Expo, Javits Center, NY. Exhibitors at the JA Int'l. Jewelry Show at Javits, NY. Exhibitors of the Las Vegas Gift & Souvenir Show. Exhibitor list from the Motivation Trade Show, Chicago. Assn. of convenience stores trad show in Las Vegas. List of exhibitors at the NAMM Trade Show. National Association of Broadcasters Las Vegas trade show exhibitor list. FORUM PUBLISHING and our mailing list compilers have no affiliation with any of the trade shows listed on this website. All trade show names, trademarks, logos and copyrights are the property of the trademark or copyright holders only. Indemnity Agreement Regarding Do-Not-Contact Lists & Terms and Conditions ("Customer") has requested to receive from Forum Publishing certain data which may include the names and phone numbers of persons who may appear on one or more do-not-contact lists maintained by one or more States or other governmental entities. Forum Publishing has agreed to supply said data in exchange for the execution of this agreement and the related purchase order/invoice. Customer agrees and warrants that all data which Customer receives from Forum Publishing and any related corporation, shall be used only in strict compliance with all applicable federal, state, and local laws, rules, regulations, and ordinances, including but not limited to those concerning privacy, telephone, fax, and email solicitation, and direct marketing. Customer acknowledges that it is Customer's sole responsibility to determine the applicability of any such laws, rules, regulations and ordinances and the identity of any registered or listed persons, Customer further warrants that Customer has requested the do-not-contact data based on the fact that, at the time of communicating or attempting to communicate with any person therein listed, Customer will be exempt from the application of all applicable do-not-contact laws, rules, regulations, and ordinances and that Customer understands the requirement that Do Not Call Registrants be purged from their calling list in accord with the procedures outlined by the FCC, FTC, and the individual States customer does business in, in the instances where exemptions may not be applicable. Customer further agrees to indemnify and hold harmless Forum Publishing and affiliated entities against any and all damages, fines, penalties and assessments finally awarded in any litigation, arbitration or administrative action, along with any settlement payments made in lieu thereof, including all related costs and attorney's fees arising out of or otherwise related to the breach of this agreement, the Terms and Conditions, or any alleged violation of law, rule, regulation or ordinance based in whole or in part on Customer's use of the data received from Forum Publishing or any related parent and subsidiary corporation. This agreement shall be governed by and construed in accordance with the internal laws of the State of New York without regard to its conflict of law rules. Customer agrees that any dispute under this agreement or the Terms and Conditions shall be exclusively heard in the state and federal courts located in Suffolk County, NY, and further agrees that said courts are a convenient and appropriate forum. Due to the fact that our products can be copied easily, no order will be returned or accepted for credit, or otherwise. Buyer agrees that all electronic credit card payments are agreed to be paid for according to the card issuer agreement. Buyer agrees, understands, and acknowledges that when Forum Publishing, sells a list to any customer, it neither assumes nor accepts any responsibility of any kind for defects, deficiencies, mistakes, ambiguities, or inaccuracies of any kind or effect with respect to the list rented herein, as these are the responsibility of the list owner or compiler which are third person and unrelated Forum Publishing, Buyer aggress, understands, and expressly acknowledges that while Forum Publishing believes this information to be accurate, it does not warrant or guarantee any degree of accuracy of the list purchased, nor the outcome or results of any mailing or promotion or any other undertaking of the Buyer/ and Forum Publishing shall not be held liable in any manner with respect thereto or otherwise. The liability of Forum Publishing and its representatives shall be limited to the amount paid by buyer hereunder. Forum Publishing shall not be liable for indirect, special, incidental or consequential damages (including, but not limited to, damages for loss of business, loss of profits or investments or the like) whether based on breach of contract, breach or warranty, tort (including negligence), product liability, or otherwise, even if Forum Publishing or it's representatives have been advised of the possibility of such damages, and even if a remedy set forth herein is found to have failed of it's essential purpose. The limitations of damages set forth herein are fundamental elements of the basis of the bargain between Forum Publishing and buyer. Forum Publishing would not have been able to have provided its goods and services without such limitations. Without in any way limiting the generality of the foregoing, Forum Publishing assumes no responsibility or liability for determining whether phone numbers on its lists may be registered under federal and/or state "do not call" laws or other laws governing telemarketers. All individuals and organizations covered by such laws shall be fully responsible for compliance therewith in connection with the use of lists rented hereunder. Buyer shall not: re-rent or sell the list or otherwise permit any use of the list by or for the benefit of any party other than Buyer; publish, distribute or permit disclosure of the list, other that employees and agents of the Buyer for use in the Buyer's business; use or permit use of the list for the purpose of compiling, enhancing, verifying, supplementing, adding to, or deleting from and mailing list, geographic or trade business directories, classified directories, classified advertising, or other compilation of information which is sold, rented, published, furnished or in any manner provided to a third party; use or permit of the list for the generation of any statistical information which is sold, rented, published, furnished or in any manner provided to a third; use or permit of the list to prepare ant comparison to other information databases, which is sold, rented, published, furnished or in any manner provided to a third party; or use or permit of the list in connection with individual credit, employment or insurance applications. All lists and other goods and services provided by Forum Publishing are provided ?as is' and Forum Publishing expressly disclaims all other representations and warranties, express or implied, relation to any such goods or services, including their fitness for a particular purpose, their quality, their security, their merchantability or their non-infringement. It is acknowledged that the Client is not relying upon Forum Publishing with respect to any legal advice in connection with the services rendered by Forum Publishing pursuant to this Agreement. Forum Publishing hereby advises Client, and Client herby acknowledges, that the Federal Telephone Consumer Protection Act of 1991 (the "TCPA"), The FCC and the FTC's Telemarketing sales rules, regulates the use of telecommunications for marketing products and services. Client represents and warrants to Forum Publishing that any and all actions taken by Client pursuant to this Agreement shall be in compliance with the provisions of the TCPA. FCC and FTC regulations and that Forum Publishing shall have no liability whatsoever for ant actions done or performed, or caused to be done or performed by Client or Clients customers in connection with the Services, and Client agrees to indemnify and hold Forum Publishing harmless there from. Forum Publishing shall not be liable to Client, or to anyone who may claim any right, due to Forum Publishing's relationship with Client, for any acts or omissions in the performance of said services on the part of Forum Publishing or on the part of Forum Publishing agents, officers, directors, or employees or assigns which results from the delivery of Services made to Client by Forum Publishing and it's agents, officers, directors, employees or assigns, unless said acts or omissions of Forum Publishing or its agents, offices, directors, employees or assigns are due to their gross or willful misconduct. Forum Publishing will not accept any returns or make any reimbursements, NO EXCEPTIONS. 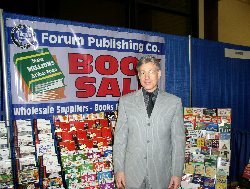 All orders, whether verbal or in writing, received from the Buyer by Forum Publishing required Forum Publishing to create a custom order for the client. Therefore, the Buyer is responsible for the payment of this custom order: and this financial responsibility shall not be released due to the Buyer rejecting said order, refusing to accept shipment, "stop payment" on their checks, or changing the nature of the order, etc. Buyer aggress to reimburse Forum Publishing, for all expenses, including reasonable attorney's fees, incurred by Forum Publishing, to this agreement, the products rented hereunder, and/or payments due therein, shall be in Suffolk County, NY, and in the judicial district then closest in proximity to the headquarters of Forum Publishing -Lists Buyer expressly acknowledges personal jurisdiction within New York. No modifications of this agreement may be made unless they are in writing and signed by the party to be charged. Time is expressly declared to be the essence of this agreement, and it is specifically agreed that no waiver of any breach or default by the Buyer shall be deemed a waiver of any breach or default thereafter occurring. Forum Publishing, as a result of Buyer's failure to pay when due the invoice prices herein. Venue for the filing of any action related herein shall be in Suffolk County, New York within the judicial district closest to Forum Publishing headquarters.